I come from a large family (5 kids), and over the years it has gotten a bit difficult to get all of us together in the same place at the same time. We make a point of getting together at least once a year, but even that has gotten harder and harder to do! Luckily, we all value that time together, and we all make it happen. 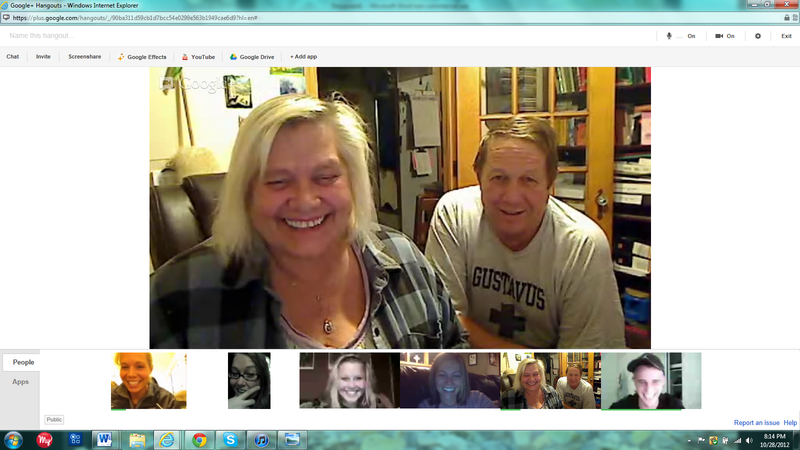 The last time we all got together was for Stella’s baptism back in March, and the next full family get-together won’t be until this February for Emma’s wedding, so in the meantime, we decided to try out the “hangout” feature of Google+. It’s like Skype, but you can have multiple people on the call at the same time (for free!). Since I’m living in Colorado, one of my sisters is currently traveling through Missouri with her boyfriend, my brother is doing a semester abroad in Australia, and everyone else is scattered throughout Minnesota, it was a great way to see everyone and to catch up! It took us two tries to get everyone online at the same time today, but we were able to do it! The 2nd hangout later – Stella was in bed and the significant others were all watching football, but the siblings were all there! Even my Dad joined in on the fun for a bit!! This is the whole lot of us. After over an hour of chatting, we finally signed off so that we could all get some sleep (and my brother could go out and skydrive/surf/party/whatever he does down there!). So much fun. 🙂 I love my family!! That’s so cool, I didn’t know about that, what a great idea!!!! Yeah, we’re going to try to make it a weekly event on Sundays – whoever is around will log in. I’m excited about it! I showed this to McMister last night. Technology is amazing! How cool is that!! I love that you are all able to stay connected. I have only skyped once believe it or not, but I want to do it more, especially so various family members and friends can see Chloe more. That’s awesome 🙂 I bet Stella loved seeing your families faces! 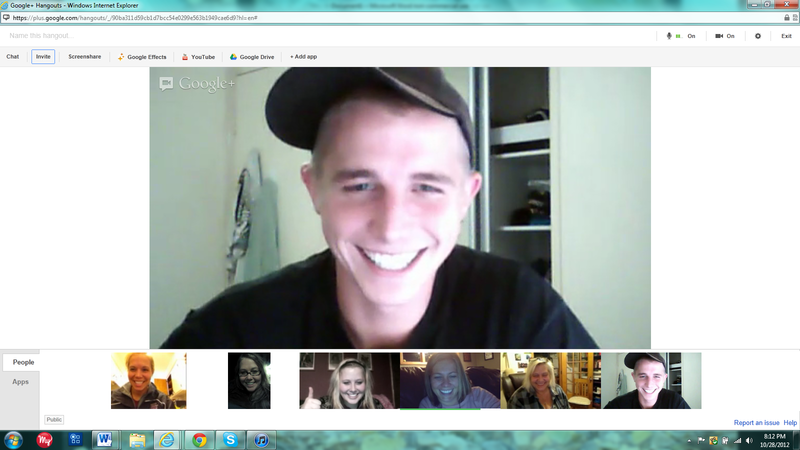 Yay hangouts! I am enjoying this feature of G+, obviously! Great reminder of how I can keep in touch with my folks now that they have headed south for the winter. Haha – ya, we all have the same smiles. 🙂 We Skype with my parents all the time so that they can see Stella! Often it’s during breakfast on my days off, b/c she is corralled in one place and I can chat while I’m cooking. It was great to actually see all the siblings at once as well though! Awwww – this is beyond sweet. I love that your family does this. My only brother lives less than a half hour away and we probably don’t talk as much as you and your siblings. Go you!! What a great idea! Where’s your brother studying? You should totally come visit him!! University of the Sunshine Coast. Studying – not so much. Partying – yes. LOL. I’d love to visit him, but tix are $1800 right now!! I loved Australia when I went down there in 2006. I will definitely make it back someday. Oh I am near him at the moment! We are on holidays at the Gold Coast and have a wedding in Brisbane. NICE place to study ha ha ha it’s the quintessential Aussie life on the sunny coast! Yep tickets are expensive but apparently there is a new route opening from Dallas to melb / Sydney which is great. This is so awesome!! I need to do this with my family… I only have one brother so that will be easy haha… but with my parents too would be fun! I always just used Skype and now it costs to do multi video calls so I will definitely need to check this out! So much fun! It’s so nice that you guys all have so much fun together! I haven’t wandered into the world of skype or the like yet, although we probably should. I know my mom would like to see the kids more often than we can manage it. It looks like you guys had a great time. Skype is SO easy and free. 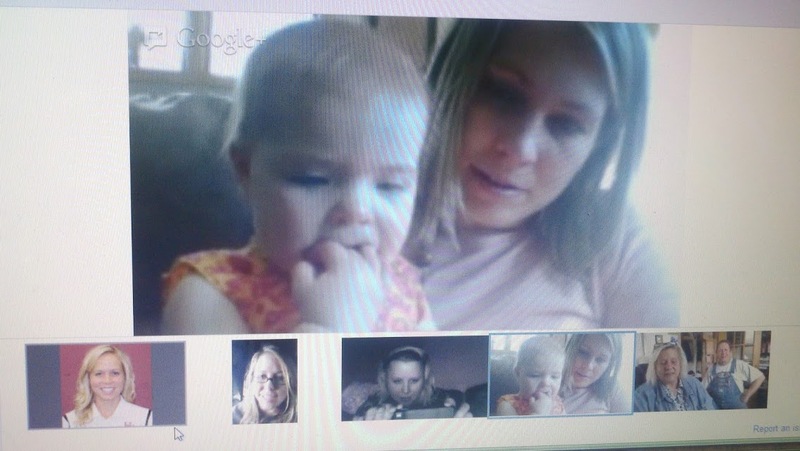 That’s normally what I use with my Mom, but you have to pay for multi-video chat, and with Google+ it’s free! this is so awesome! How cool you guys do this! Love that you’re so close with your family!!! How great that you guys do this!!! I’m so jealous of your amazing family! Looks like a lot of fun! How cool is it that technology can keep families connected like this and so important since everyone is so busy!